Last week I had the chance to spend time with Microsoft’s Surface Studio. 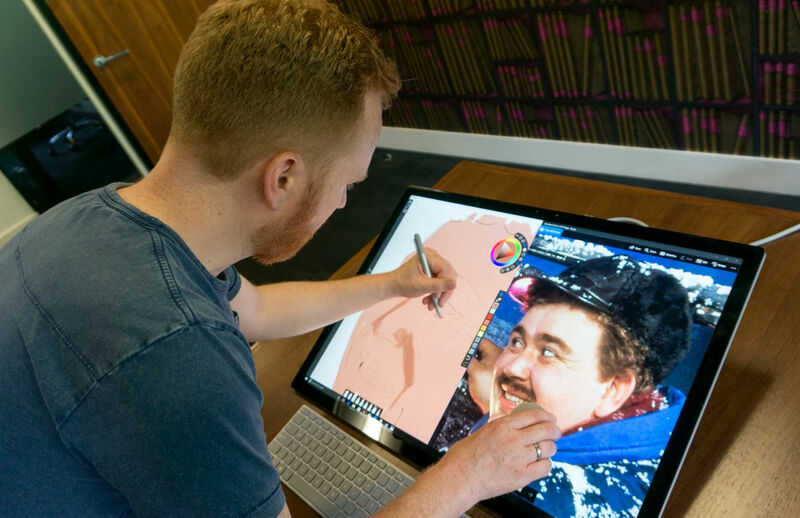 Microsoft are calling it a new category of device – being a self-contained desktop PC and a drawing tablet combined – ‘designed to put you at the centre of the creative process’. 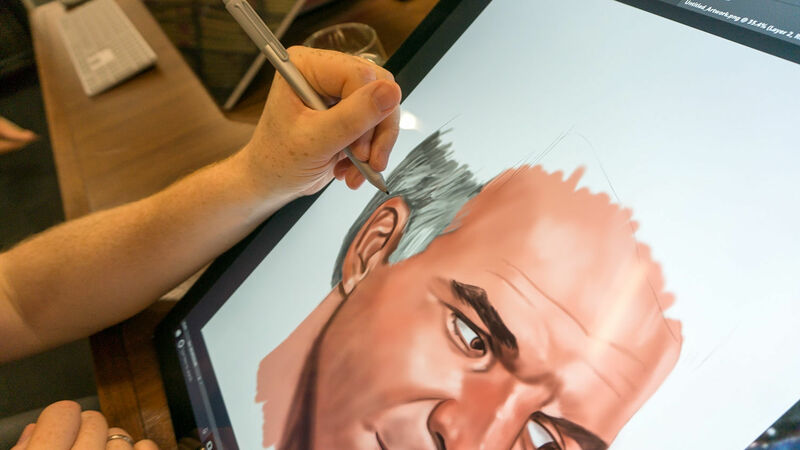 After years of Wacom’s drawing tablets being the only real option for professionals, it’s amazing to be living through a time where high-quality devices to draw on and with are becoming increasingly abundant. The downside of course is making it harder to know when you should upgrade and what you should upgrade to. 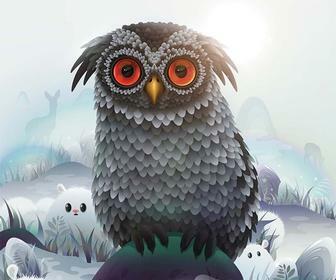 Still, hopefully with more competition, us artists and designers are going to be the winners. I’m hoping to spend more time with the device soon to be able to provide a more detailed review, but in the meantime, here are some initial impressions. Just as a bit of background, in my studio I currently work on a 5K iMac with an A4 Wacom Intuos Pro tablet. I also work on an iPad Pro with the Apple Pencil, something which has increasingly become part of my workflow over the last year or so. 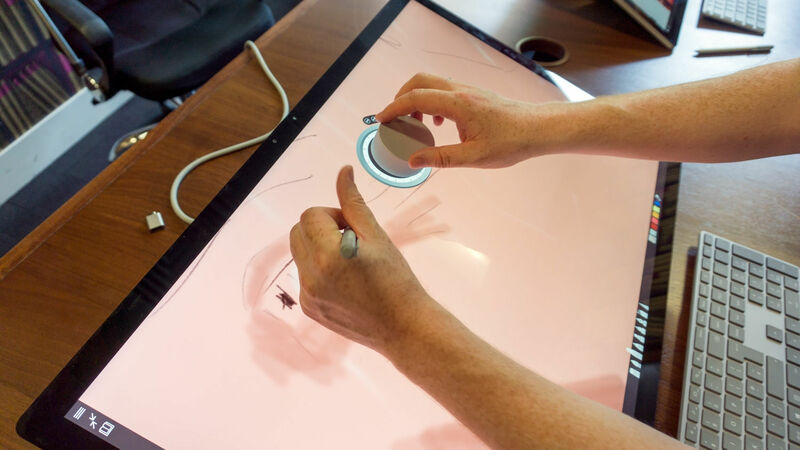 I’ve also previously reviewed a Wacom MobileStudio Pro and a 27-inch Cintiq for Digital Arts. With a 28” ‘Pixel-Sense’ touch screen display – and an incredibly thin one at that, just 12.5mm – the Surface Studio's aesthetics clearly means business. With the black, curved frame, the aluminium base and the incredibly thin display, at first glance this could easily be mistaken for an Apple product. On one hand you could take that as one from the ‘imitation being the sincerest form of flattery’ pile. 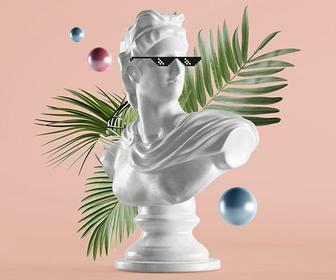 On the other more generous side, you could also see it as design team that’s worked hard to create something as beautiful and minimal as possible that will work well as the centrepiece to a modern creative’s setup. With that said, the base and stand have a quite angular feel to them, which you notice against the generous radius on the corners of the display. This detail possibly betrays its non-Apple origins, but equally, as Apple haven’t released anything like this yet, whether something is on the way or not, the first round goes to Microsoft by default. The Wacom Cintiq 27HD is the nearest equivalent, but of course is only a secondary screen, not a self-contained machine and screen. The aspect ratio of 3:2 stems from it being designed from the ground up as a display you can draw on. 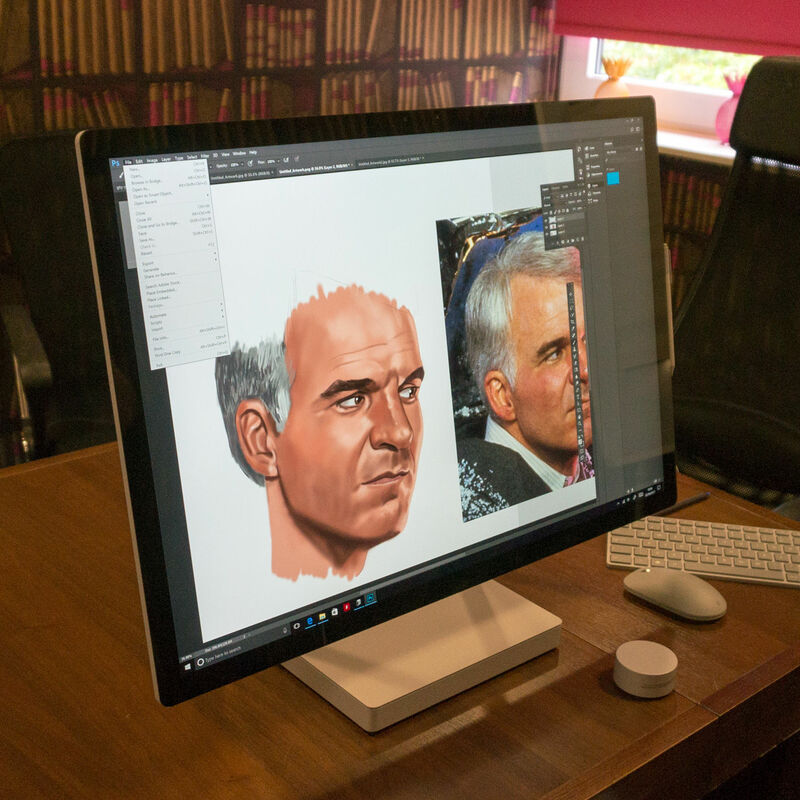 The aim is to give you as much comfort as possible whatever you’re drawing, where a more widescreen display would of course restrict you somewhat for portrait work. With a zero-gravity hinge and a counter-spring system, the screen can be moved to any point between a standard eye-level vertical (above) position down to a 20 degree angle (the ‘Studio Mode’, below), matching a standard traditional drafting table. Just thinking in practical terms, drawing feels most comfortable at the flattest position, and the standard monitor position makes sense for most other uses, so I’m not sure how often I’d use it an an arbitrary point in between the two. In this regard, comparisons to the larger Cintiqs are invited. There’s plenty of evidence to show that it’s better to spend (far) less time sitting down to work. With the ‘Ergo’ stand for the Cintiqs, you can do just that, and actually lift the screen up towards you in a standing position. There’s also the Ergotron LX Desk Mount LCD Monitor Arm which gives you even greater freedom of movement, and even rotate the Cintiq into a portrait orientation. The fact that the Surface Studio can’t be tilted back from the higher arm position means that while it can be tilted into a comfortable position for sitting and drawing, it’s still less flexible than either a smaller tablet or a large Cintiq with a stand. Of course there’s nothing to stop you placing the Studio on a higher table and/or stacking up some books, but that partially defeats the point of having an aesthetically pleasing device like this in the first place. Reduced flexibility aside, the Surface Studio’s display is excellent, and whereas I found the Cintiq 27HD to feel amazing to draw on, the colour range and brightness aren’t a patch on this. Whilst I wasn’t able to do a side-by-side comparison, it’s the closest I’ve seen to the amazing 5K iMac. If you care about your pixels, the 28” Surface Studio is 4,096-by-2,304 – while the 27” iMac is 5,120?by?2,880. Of course with the Cintiq, partly the ‘sacrifices’ the display makes are to do with the fact it’s designed primarily for artists to draw on. You don’t actually want a display to be too glossy, either in terms of being reflective, or not having enough friction to draw ‘against’. The initial time I spent drawing on the Surface Studio was comfortable enough, but certainly smoother than the Cintiq or an Intuos. Without a longer session it’s hard to say if this is something that you’ll simply get used to, or will become a more apparent weakness. There's a choice of nibs with different levels of friction. 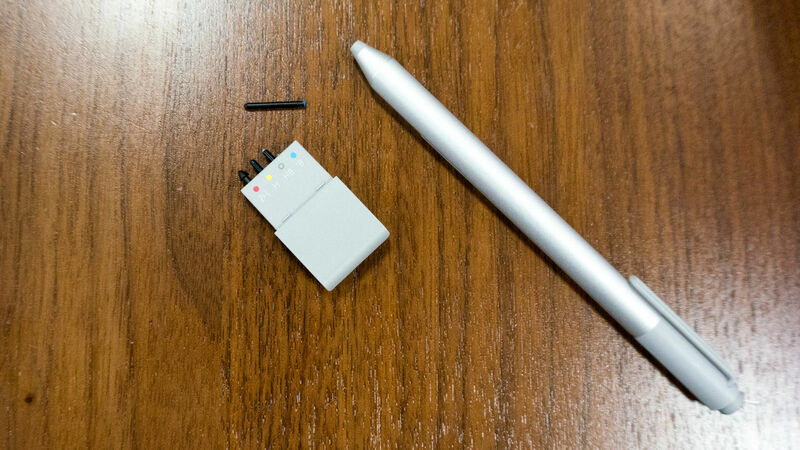 The pen itself feels okay to hold, though my initial impression is that it has a flimsier, lighter feel than either a Wacom pen or that perfectly weighted Apple Pencil. There also seemed to be a larger gap between where the pen touches the screen and the mark being made (the parallax effect) than I’ve noticed on either a Cintiq or an iPad, though further investigation is needed here, and equally, the brain quickly learns to compensate for this. 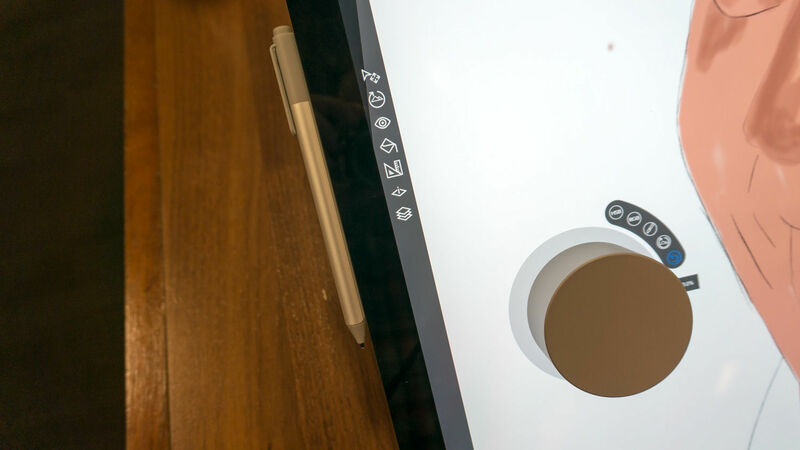 Finally, an additional component, available separately, is the Surface Dial. It looks very cool in the promotional videos for sure, and in theory you can do lots with it, though at the moment it’s not been configured by Adobe for Photoshop. Also, unlike Wacom’s multi-button remote which comes with the larger Cintiqs, you can’t configure the functions yourself. With the Wacom device you can customise it for yourself, and then thanks to muscle-memory you’ll soon be using those essential keyboard shortcuts without a second thought. This is important because with a large drawing screen angled in front of you, there’s no room for the keyboard in front of it. It remains to be seen whether the smoothly turning wheel could be as useful. The simple difference is that, however many functions are incorporated, you’ll need to look away from your drawing to access them. 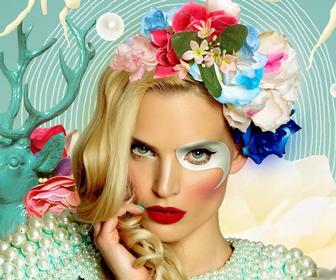 For instance, as a painter I am constantly pressing the ‘alt’ key to use my colour picker in Photoshop. With the wheel this is presumably going to be at least a turn and a click away, so then I would still need my keyboard within reach, albeit at the side. In theory it could be useful for zooming in and out, but the Surface Studio also supports multi-touch, so I can go this with my hand anyway. One cool feature of the wheel is that you can turn it to gradually change your selected colour on the fly in a smooth continuum. I can see this being great for specific instances likes say, drawing water, but it’s hard to say how useful it would be otherwise. I remain to be convinced that it could be as quick to use as having separate physical buttons and/or just having the palettes in Photoshop suitably arranged for your workflow. To conclude, my initial impression was that it’s an impressive looking device, and it’s exciting because it could mark the start of a new class of device for professional creatives. But at £2,999.00 for the 1TB / 8GB RAM model from the Microsoft Store, versus £1,449.00 for an equivalent iMac + £1,449.99 for a 22” Cintiq, it’s actually around £100 less to own both of those impressive devices, i.e. the very best screen available and the best drawing display. I’m hoping to get to spend more time with one to really put it through its paces on a complex piece of artwork, but in the meantime I should say that while it’s certainly fun to use, I can’t yet unreservedly recommend it as a professional piece of kit. For all the Surface Studio's external distinctions, inside it’s just a collection of the same components you’ll find in other all-in-ones and gaming laptops. For performance testing we chose to compare it to another recent AIO, HP’s Envy Curved All-in-One 34, as well as several gaming laptops based on similar mobile quad-core CPUs and a range of GPUs. We decided to exclude Microsoft’s Surface Book and Apple's iMac (which is also built from laptop components). While we enjoyed the concept of a Surface-to-Surface comparison, the dual-core 6th-gen Skylake Core i7-6600U found in last autumn's Performance Base update lagged far behind the other systems in our sample. And the iMac is just outdated. 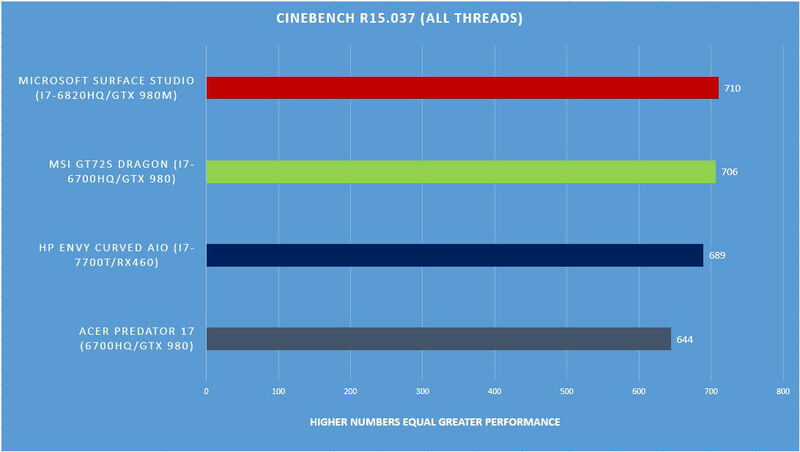 The first benchmark we've run is Cinebench's rendering test, which tells you how fast the processor is (about the same as most top-flight AIOs and laptops).